PresentationTube is a video presentation sharing network developed to help teachers, students, and business professionals produce and share quality video presentations. PresentationTube offers a free video presentation recorder that synchronizes a variety of visual aids, including presenter's audio and video footage, PowerPoint slides, drawings, text, and web content. It involves the audience via scrollable slide thumbnails and discussions, with unlimited video storage and delivery. 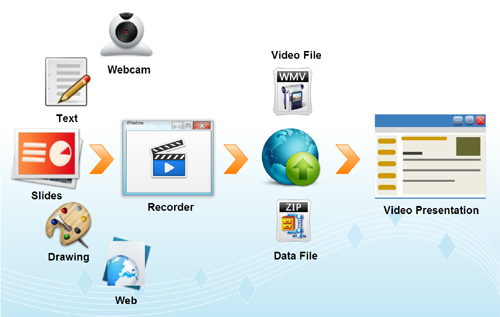 How to start recording and sharing your video presentations? Record video presentation: Download PresentationTube Recorder and start recording and narrating your presentations using PowerPoint slides, written text, drawing, and web content. Upload video: Upload your video file to PresentationTube network and enjoy the new and interactive features of video presentations. Share your video presentation: Share your video presentation via email and social networks, or embed the video presentation in your course pages, website, or blog.